IAP2 USA - National Dialogue: P2 Crisis or Opportunity? Bringing the conversation to a community near you! In 2016, the political climate in the U.S. has shone a light on the deep divides that seem to have created an "unbreachable gap between Americans". The "difficult situation" provided a rare and crucial opportunity to showcase public participation’s role in bringing people together. 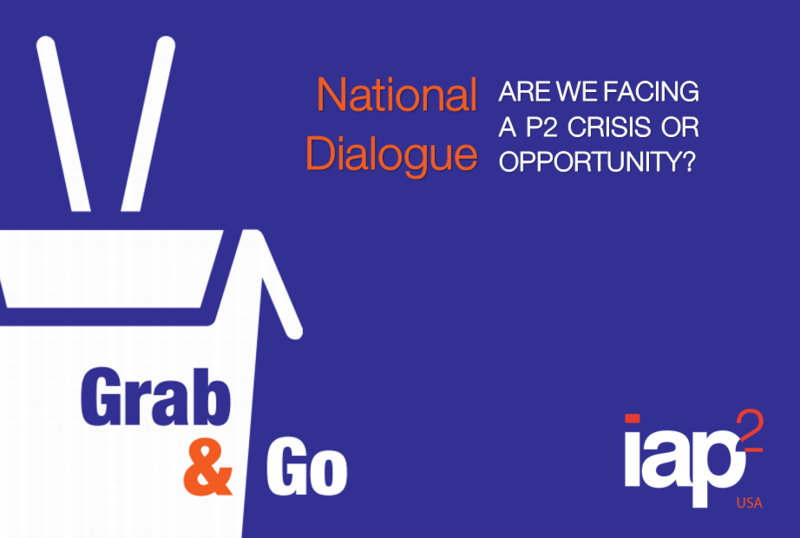 Like many things in P2, the National Dialogue came from humble beginnings. In February 2017, the conversation kicked off in San Diego, California during the Skills Symposium. Practitioners from across the United States gathered together at a social to confront a question that had been brought to the forefront after the turbulent 2016 Presidential Elections: "Are we facing a P2 crisis or opportunity?" This question hit a chord deep within many in attendance, and the subsequent conversations made it clear that it was something be explored. Thus, the first National Dialogue came to be. We hear a constant message that we are a divided country. What are the challenges to our work? How are those challenges affecting the spirit of public participation? What might we do as individuals and organizations to support quality P2 in our communities and nation? Leah noted the Pathways session had the objective of reviewing the results of previous dialogues and determining how IAP2 USA could build on the results (and the passion) that came out of the discussions and move forward with actions based on those results. For the first hour of the session, Penny Mabie, Puget Sound Chapter, conducted the dialogues, with three small groups as the basis of the World Café. After each discussion round, Penny asked each table group to note their collective responses and identify three key themes. As a result, the dialog ended up with a collection of key themes in response to each of the questions. Participants then compared their session’s outcomes to the themes identified at all the other National Dialogs. After much discussion, a combined list of key responses was compiled. For the second question, regarding challenges, the group organized responses into several categories that seemed to reflect the greater thinking. The Pathways participants regained some positive energy as they discussed the third question and all the potential actions that could address the challenges presented by the current state of dialogues and civic engagement in the U.S.
During the discussion, the question was asked whether these results were reflective of how things stood in other parts of the world. Australasian, Canadian and African participants all concurred that many of the attitudes and emotions and challenges applied to their geographies and political contexts as well. The participants developed the following list of what they thought were the most promising actions that could be undertaken to help P2 practitioners engage their communities. Some actions were identified as those individuals (participants) could take, some were suggested for practitioners, some for decision-makers, and some were for IAP2 USA to undertake. Pathways participants were eager to see these actions put into play. Leah Jaramillo, IAP2 USA chair, agreed to take the lead on next steps. Penny Mabie put together a brief Powerpoint to present the Pathways outcomes to the rest of the IAP2 North American Conference attendees at a closing plenary. Leah will put out a call for volunteers and help organize efforts moving forward. Leah will also brief the IAP2 USA Board of Directors on the outcomes. Get the conversation started in your area! 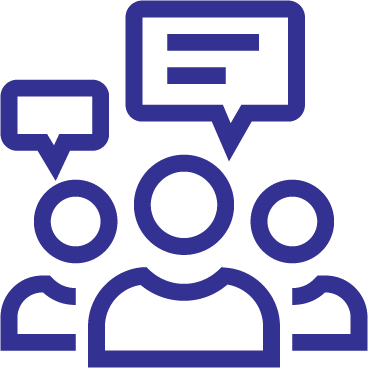 To facilitate a national dialogue, IAP2 USA has created a guide to help IAP2 chapters, members and friends host their own conversations in their own communities. This guide provides an event schedule and agenda, a review of the techniques used, and templates for everything from the invitation to event reporting. 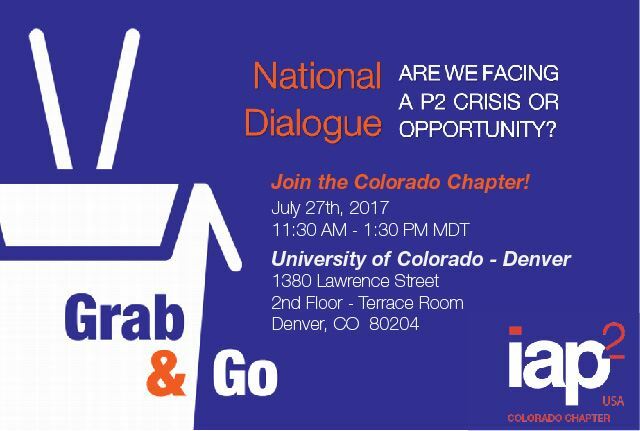 We will report back on what we have heard from around the country at our IAP2 North American Conference in Denver. Check out Inside P2's interview of IAP2 USA President Leah Jaramillo as they talk about the IAP2’s National Dialogue initiative, its focus and objectives, its origins, where it will happen and its culmination at the IAP2 North American Conference in September! Listen now! Resources: Take some, leave some. NOTE: You must be logged in to add resources, or comment on posts. Formerly known as the "Centerist Project"